The programme reached the milestone today (Tuesday 14August) meaning that across Scotland more premises than ever before now have fibre broadband available to them. 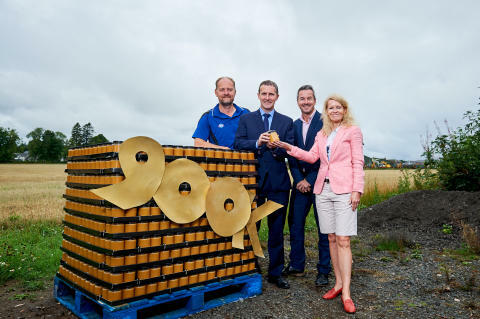 Cabinet Secretary for Transport, Infrastructure and Connectivity Michael Matheson met with Andrew Scarlett from Scarletts Honey, a business in rural Perthshire which has benefitted from the programme’s deployment. Across the country around 4,500 new fibre street cabinets are now live and more than 11,800km of cable has been laid by engineers from Openreach, who are continuing work on the ground into 2019. Thanks to additional investment as a result of innovation and new funding generated by stronger than expected take-up, the programme will continue to deliver new DSSB deployment in every local authority area during 2018 and into 2019, complementing the fact that more premises than ever before now have fibre broadband available to them. To check whether you are eligible for a faster broadband service than you currently receive, check with your current provider or on price comparison websites. Robert Thorburn, Fibre Partnership Director for Openreach in Scotland, said: “The Digital Scotland project and our hard-working engineers have delivered more coverage at faster speeds than expected. As we mark another major milestone, it’s fantastic that work will continue into 2019 thanks to extra funds generated through innovation, partnership efficiencies and strong take-up. “Hundreds of the latest properties passed by the new network can now connect to the most reliable and fastest residential broadband available as we’re using more Fibre-to-the-Premises (FTTP) to help these harder-to-reach homes join the digital revolution. The Digital Scotland Superfast Broadband programme aims to provide fibre broadband infrastructure to parts of Scotland not included in commercial providers’ investment plans, and has reached over 95 per cent of premises when combined with current commercial roll-out plans.